PARKING AND TRAFFIC SIGNS - For Safety and Direction........a must have! Traffic signs provide proper safety messaging and direction throughout your roadways and parking lots. Parking Signs maintain an organized and regulated parking lot. Parking Signs make it easy to provide specific directions and eliminate confusion. 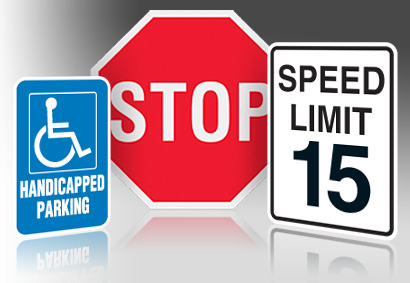 Traffic signs and Parking signs improve safety, prevent accidents and post your policies. Depending on what your needs are, you may want to consider reflective, high-intensity or engineer-grade made out of aluminum, steel or polyethylene. This can be prevented with a special, unique topcoat called Duroshield. Duroshield is a tedlar laminate on top of the vinyl sign face which is adhered to the sign's raw material. This special laminate is so tough that it is able to stand up to the harshest weather conditions and chemicals. The topcoat is graffiti-resistant blocking solvents and chemicals, allowing graffiti to clean right off and never damage the sign face. For more information or questions, please e-mail thesignstudio@sbcglobal.net or give us a call at (818) 843-9200.